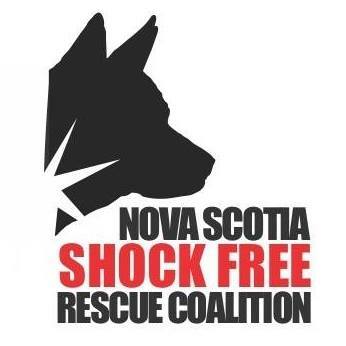 Misfit Manor Dog Rescue is pleased to have joined forces with Nova Scotia Shock Free Rescue Coalition. At Nova Scotia Shock Free Rescue Coalition , we are governed by principles that demand the highest level of humane and ethical treatment of dogs. With years of experience, training and research on the subject, we are a coalition of rescues who stand together against force training. We will only employ and will promote trainers who use positive, reward-based training practices. We will only accept the use of humane devices such as flat collars, soft martingales and body harnesses. In our adoption agreements, we will stipulate all training for our rescue dogs will be positive training. As stated in our mandate we do not allow the use of methods that are punitive, inhibit learning, increase fear, promote aggression or could result in physical and psychological injury to the dog. We recognize that they teach the dog through the continuous threat of fear and pain. In our view, this method, often called balanced training, is inhumane.